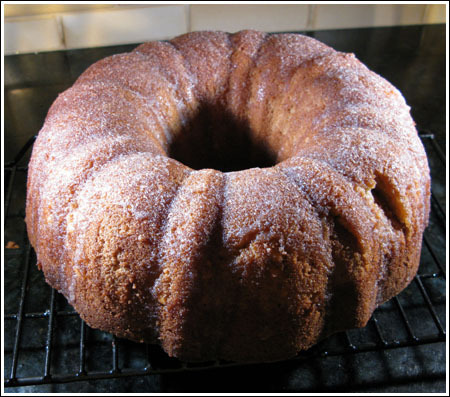 This Brown Sugar Bourbon Pound Cake had been on my “Make Soon!” list for the past 5 years. I’m not sure why it took me so long, but I finally got around to trying it today. Unfortunately, I haven’t actually tasted it….unless you count the tiny pieces that fell off the bottom (okay, they didn’t really fall) when I inverted it. I gave this cake to my friends next door who have promised to report back and maybe bring me a piece. I weighed ingredients as I went and again, attempted adding metric. About the flour, I used White Lily, which is different from cake flour and which you can buy here. It’s definitely worth ordering not only for cakes, but for the best biscuits ever. Oh, one more thing. The recipe didn’t say to do it and it’s not necessary, but before I inverted the cake I poked some holes in it and drizzled about a tablespoon of straight bourbon over/into the upside down cake. I know what you mean. Why eat a Bourbon cake if you can’t taste the booze? This cake is pretty strong and in a good way. Looks really good Anna… Does it have a distinct bourbon flavor? I prefer when the flavor is strong. Will have to try my hand at this one later this week as I have some bourbon to use up. I love the beauty of a good-looking bundt cake. Ha ha. Happy New Year!!! Sandra, the big screen is awesome. I wonder how long it will take for me to smear it up? Megan, my next door neighbor/friend is quite used to getting cakes with big chunks taken out. The gift of a whole cake almost made her teary-eyed. Okay, so not teary-eyed, but she was surprised. Then she promised she’d bring me some….but I haven’t heard from her yet and am wondering how long I should wait before calling. Oh, I know…..I am so tacky…. Thanks Lara! Happy New Year to you! That looks beautiful…not to mention delicious! Your cake looks wonderful. My problem would be the giving away part. Somehow a cake with a piece missing just don’t look as nice. Love the pictures with the new camera. I have Canon PowerShot SD630 and I love it!! Great little camera with a BIG screen!! Carole, I think you will have a lot of fun with the White Lily. It’s great in cakes and perfect for biscuits. White Lily has a lot of recipes on their web site, so if you take a recipe from there, just use those measurements (obviously). For recipes calling for all purpose, I usually weigh out 4.5 oz White Lily per 1 cup all purpose called for. Reason being, White Lily weighs a bit less than all purpose. If you don’t have a scale, White Lily says that for every 1 cup all purpose, you should use 1 cup plus 2 tablespoons White Lily. I just ordered 2 5# bags of White Lily. I have never used it before. I use White LIly for everything. It sometimes goes on sale around here for $1 a bag. I pick up several bags when that happens. It really does make a difference in cookies and bisuits. Let’s hope so! I have a feeling it is going to be great. It’s an old Good Housekeeping recipe and theirs are usually perfect. Plus, I made it slowly and carefully with room temperature ingredients. Therese, Happy New Year to You! I’m too addicted to blogging…and the Internet, frankly. If I stopped blogging, I’d just go cause trouble somewhere else ;). The Bourbon I used is called Woodford Reserve. It’s a reasonably priced award winning whiskey. I actually bought Todd a bottle for Christmas and he’s not thrilled with me for putting it a cake ;). Bourbon….hmmm. Is there a particular brand that you used for this cake? I have the White Lily flour…so I need to get the bourbon. This would be good to take to my New Years shin dig. HAPPY NEW YEAR!! Here’s to you and your blog and to more baking for 2008!! Keep this blog! I was ready to start a peaceful march to protest if you decided not to blog anymore! Glad that doesn’t have to be done!! WHEW!! Wow. I’m sure that tastes as amazing as it looks! !